People always tend to combine the old adage of east meets west and when doing so I always think, isn’t there enough spices and recipes in your own neck of the woods that you dont feel compelled to fuse the two…i guess not; and I also wonder if Spur Tree in Lower Manhattan is going to create a happy marriage of flavors when they opt to do so. 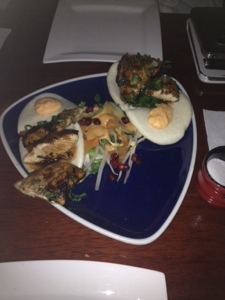 First up on deck is the mini steamed buns with sliced jerk chicken glaze with tamarind, and pomegranate seeds. Now I normally love a good steam bun and I usually like jerk chicken, however to find the best of each sold separately can always be a challenge, so needless to write I was apprehensive. When the dish arrived the chicken had a burnt appearance from all the spices, resting on a flat steamed bun and a dollop of aioli sauce I chose to fuse this dish even more and rolled it all together as if it were a taco and took my first bite. An explosion of heat rushed through my mouth like a volcano, intensely trying to hold off on the water and make sure I could taste any other spices, I breathed through my nose and finally at the back of my throat I noticed the tamarind, my teeth rested on the tenderness of the chicken and the light as air bun added a calmness that actually made all the flavors blend or should I say fuse together quite nicely. 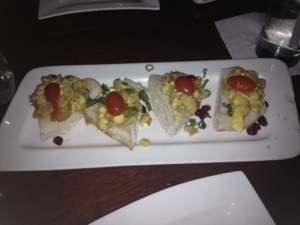 Second on deck was ackee & cod fish bruschetta. Normally I am not a real fan of tomatoes, but for some odd reason I enjoy a well made bruschetta. Maybe its the crunchiness of the crust and the softness of the bread in the middle or maybe it is the oils and herbs that I love so much, but whatever it is this bruschetta was as far as east meets west to what I am used to. This bruschetta was on coco bread, atop with a slice of heirloom tomato, needless to write I just didn’t love it; neither did it seem right to have fish on bruschetta or have coco bread serve as the traditional bread, I mean where was my crunchy edges?? It just tasted as if the ackee and the cod overpowered the coco bread, it was simply to much fish and not enough herbs and oil. 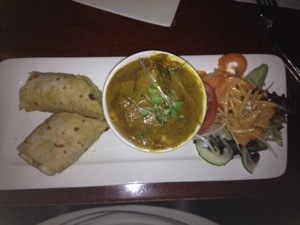 Third on deck was the seafood curry with salmon, scallops, and shrimp served with roti. Now until visiting Spur Tree I had no idea what roti was, sure you see food establishments all across Brooklyn and Queens New York that advertise roti, but I still had no idea that roti is an indian unleavened bread made from stoneground wholemeal flour and in my mind designed for dipping or sopping up, and I was correct. The curry sauce was quite tasty, chocked with caribbean spices, that really gave you the feeling that you entered into a west indian environment, no fusion here. My only concern was there was not enough shrimp or scallops, it was double downed with salmon though. 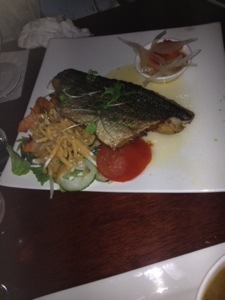 Last on deck was the Seared stripe bass with escovitch & truffle honey. Everyone knows that you eat with your eyes first, and somehow the presentation just seemed a bit off, not bad, just not pretty, and the fish was not filleted. Sure the menu didn’t note that it was filleted, but honestly who serves fish with bones nowadays; I mean why should any patron opt to eat extra slow to ensure they are not swallowing a bone or even sift through the fish with their tongue to ensure they didn’t get a bone. Once I got to the actual tasting of this fish, it was cooked to perfection and quite flavorful, but when a patron has to do all of that bone mouth diving, it takes the eating experience from pleasurable to just plain work, and who wants to work while they dine. Under a normal circumstance I would definitely write that Spur Tree is worth a try, if for no other reason than to try their attempts at east meets west, but somehow I just cant, and it is because the service is absolutely tortoiselike. From the time the order went in, we waited a hour and half for the entree and that is just plain unacceptable. Should I have gone to a Starbucks before heading there and grabbed a pastry first…absolutely NOT. When food is that laggard you lose your enthusiasm and your desire to try new things and the whole experience just becomes bleak and aggravating. Step your game up Spur Tree, because at the end of the day your reputation is all you have. Wow!! Such in depth description! ! U make me feel like im right there with you!! Brilliant blog! !